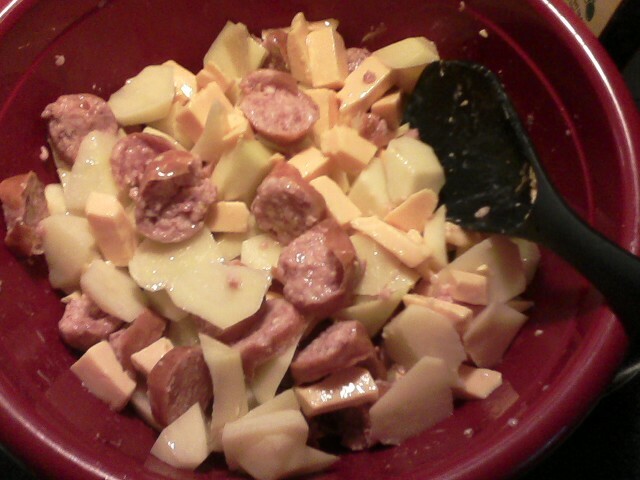 I was thinking all weekend about something that I could make for a Monday lunch for Boss Man. 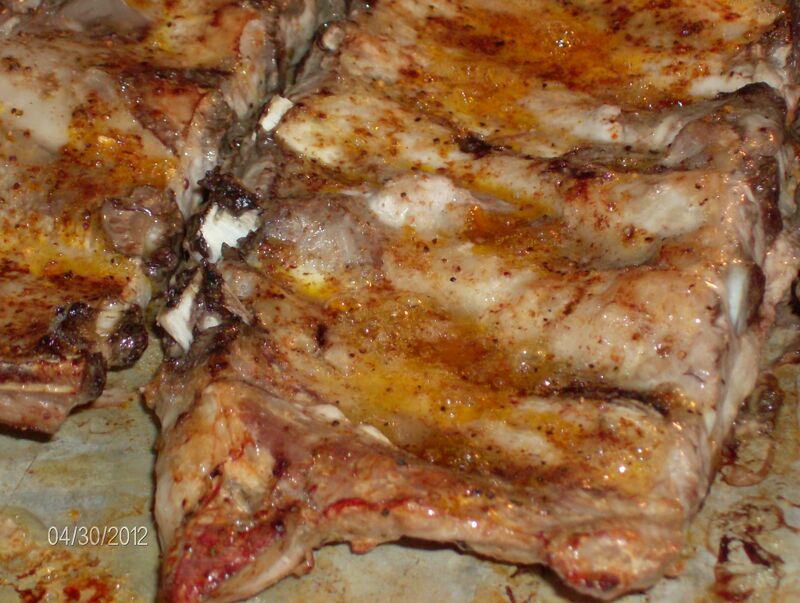 I don’t normally make him lunch (he has 2 fridges, 2 freezers, a pizza oven and a microwave in the shop…there are times where I don’t see him for days), but since it rained most of the weekend, I thought I would surprise him with a little surprise…spare ribs, slightly barbecued. And I’m sharing my secrets with you…lucky you. That’s it. 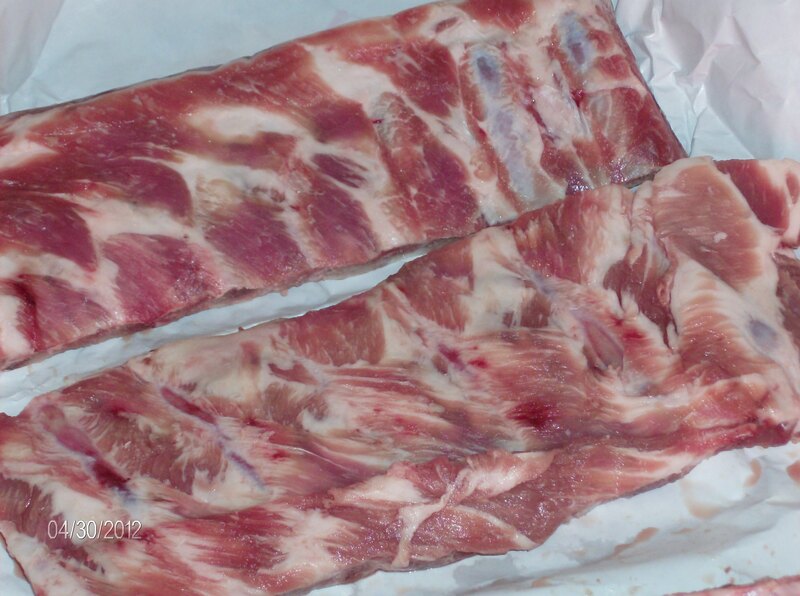 Again, for me, the big thing is getting ribs to look like ribs. And I found the secret…but let me walk you through it. Now, that's a hunk of meat that I could love! Coat with seasoning. I don’t use a ton of it, but that’s to our taste. Coat to your hearts content. 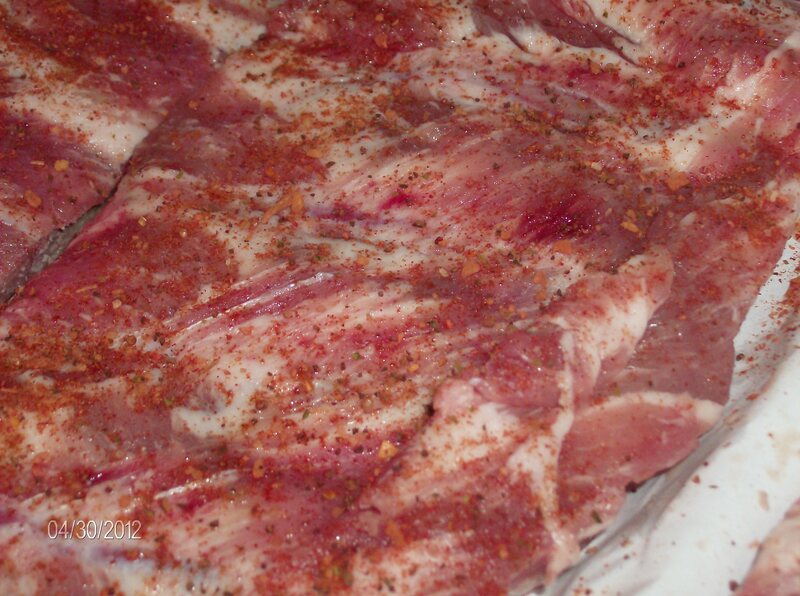 Those ribs are ready for an oven! 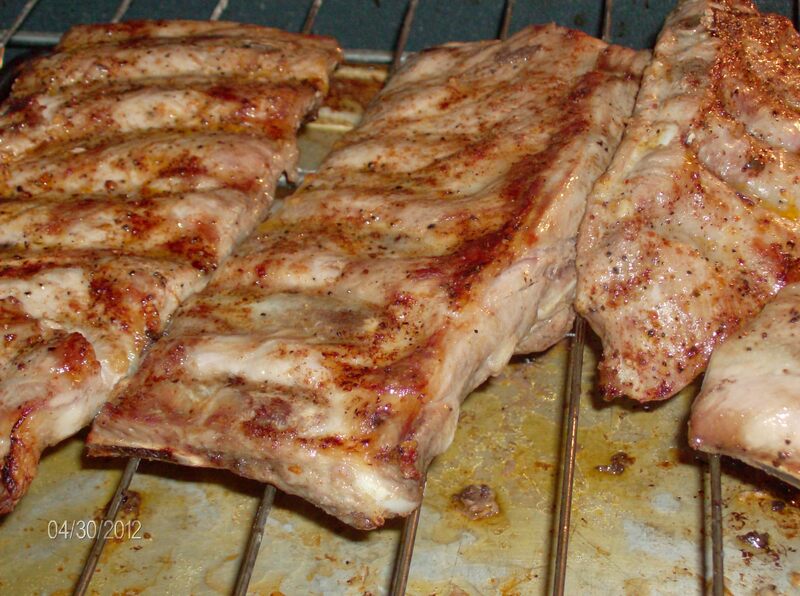 Place ribs on a shallow pan and broil in the oven for about 10 minutes on each side, or until browned nicely. Place directly on rack...don't flinch, I promise it won't hurt! 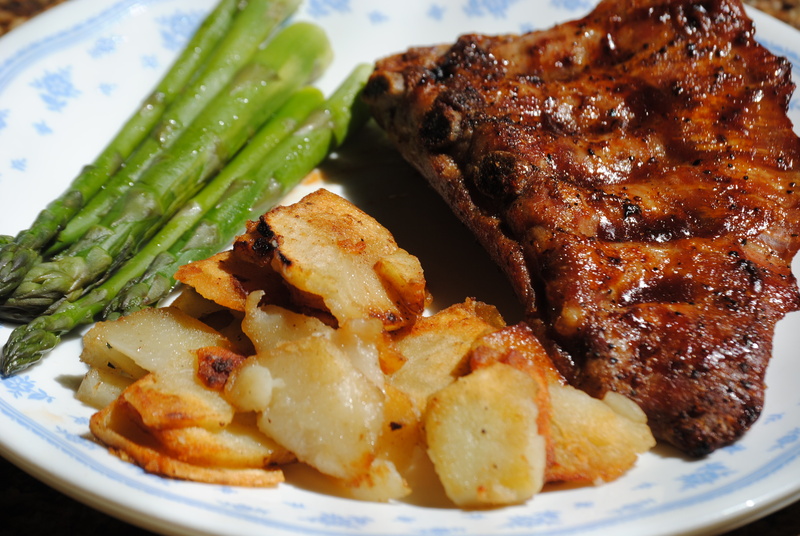 I teamed it up with butter-fried potatoes and fresh steamed-asparagus from the garden. Yes, it’s April and we have asparagus ready to go in North Dakota. Crazy spring. Go ahead, it's OK to drool...I promise. 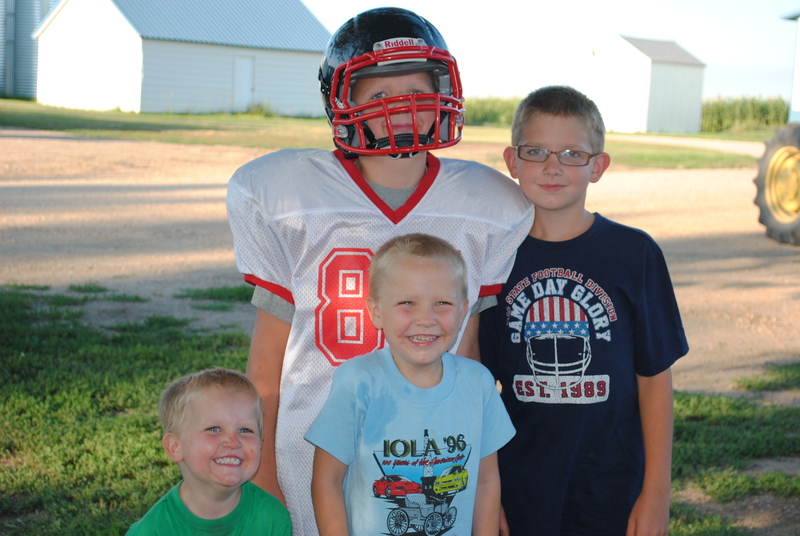 It is Labor Day, our first week of school is done, a fun weekend was celebrated and here we are…back at Monday. I promised last week that there was going to be a special surprise added to my “Celebrate a Year of Blogging” celebration, so here it is: added to the prize package is a Smart Pot 5 1/2 qt. Crock Pot and a Gooseberry Patch Slow Cooker cookbook!!! With the crock pot craze of late, and with school starting and activities picking up, I thought that a crock pot would be a perfect addition to my celebration! Be sure to go to this blog post, and post a comment…or go to Facebook and “like” Wag’n Tales! Celebrate a year with me! 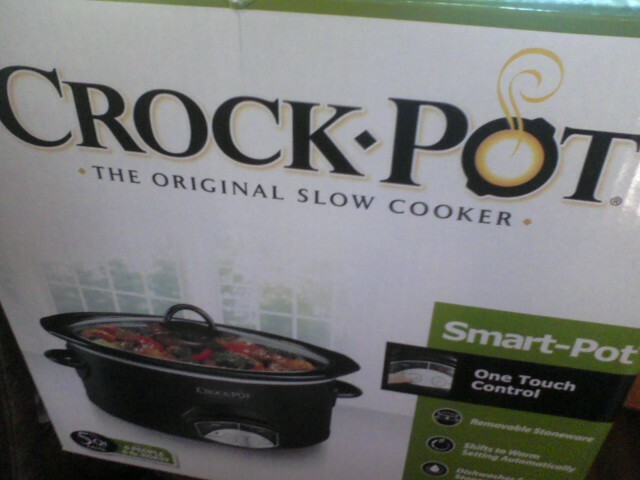 Win a Crock Pot! 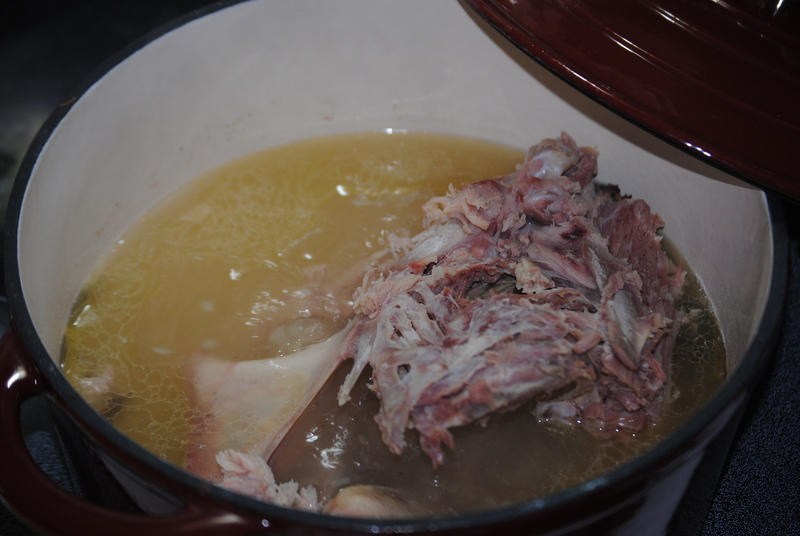 I know that I L-O-V-E my crock pot…and I know many of you do as well! This crock pot is great! It cooks to your desired time, and then switches to keep warm! As soon as my old crock pot decides to kick the bucket, I’m getting myself one of these babies! 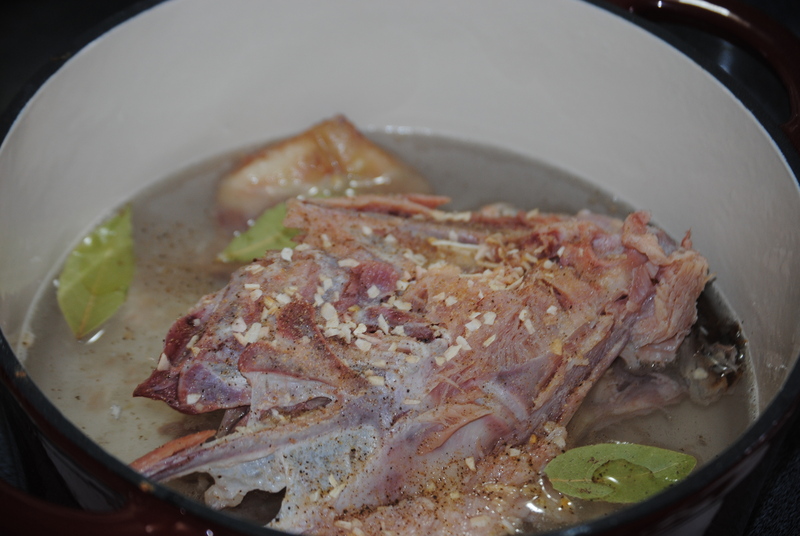 Well, enough about that, on to my Hunk of Meat Monday recipe! 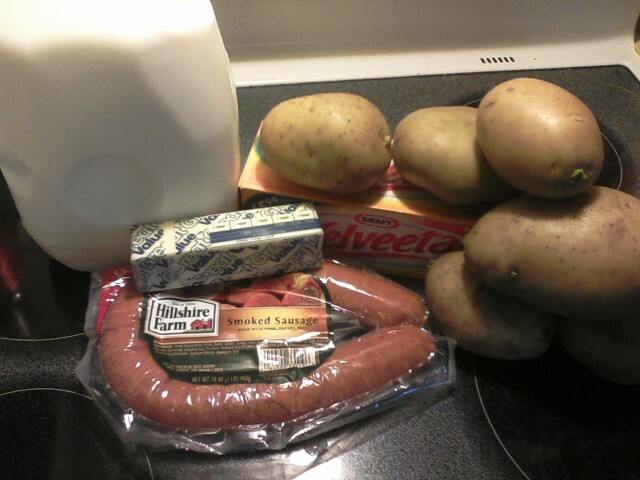 I left my sausage in bigger chunks, that way it's easier to pick out for George. Mix all ingredients together and transfer to a greased 10X8 baking pan. Bake, uncovered, at 350 degrees for one hour, or until potatoes are tender. (I would suggest stirring occasionally.) Makes 6 servings. Total – $5.77 – and since it makes 6 servings, that’s less than $1 per serving! This is my first official Hunk of Meat Monday post…but I’m hoping as summer winds down and school activities start up, I’ll have a little more time to post things like this. This summer has just been CRAZY! But here it is…Bow Tie Hotdish! 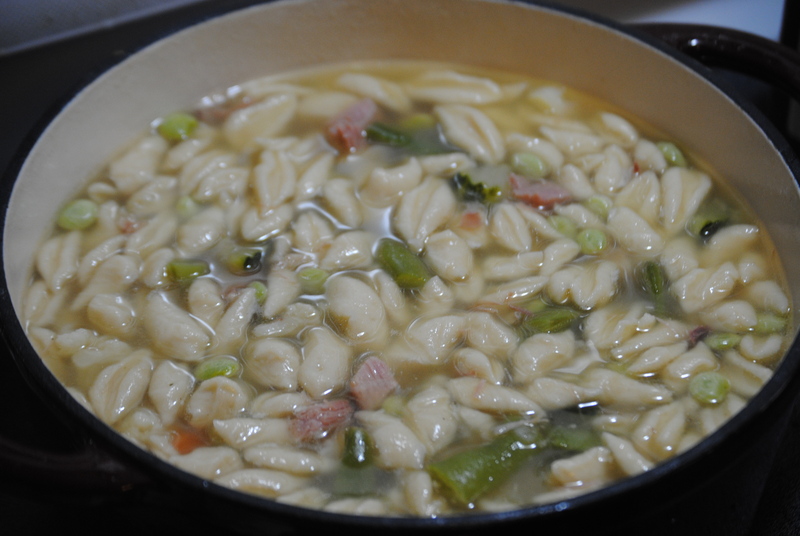 This was a new recipe for us, and it came out of the Fullerton, ND, 125th Cookbook. (And just a heads up, I’ll be giving away a copy of this book later this week…more details in a second.) 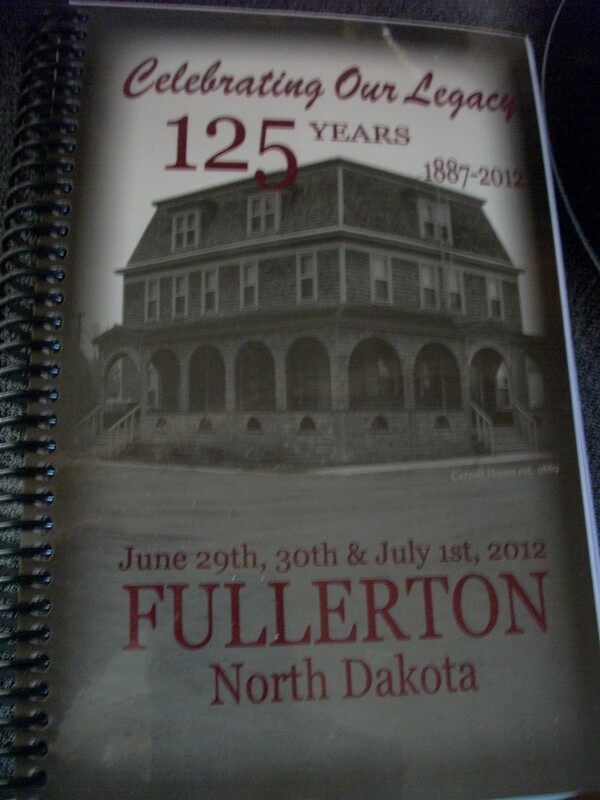 Fullerton will celebrate next summer (June 29th, 30th and July 1st, to be exact), and this cookbook is a GREAT keepsake, as well as having some awesome recipes and other information. Fullerton Cookbook, soon to a kitchen near you! 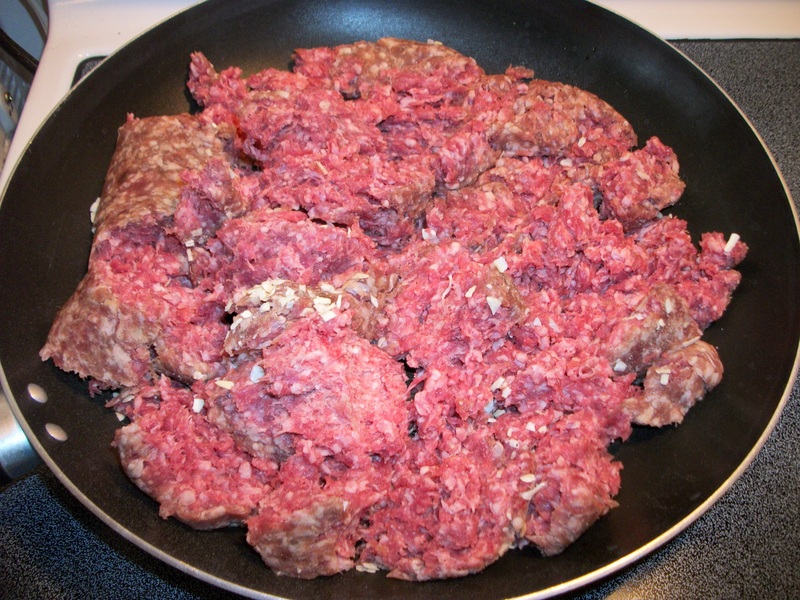 My Hunk of Meat - hamburger! 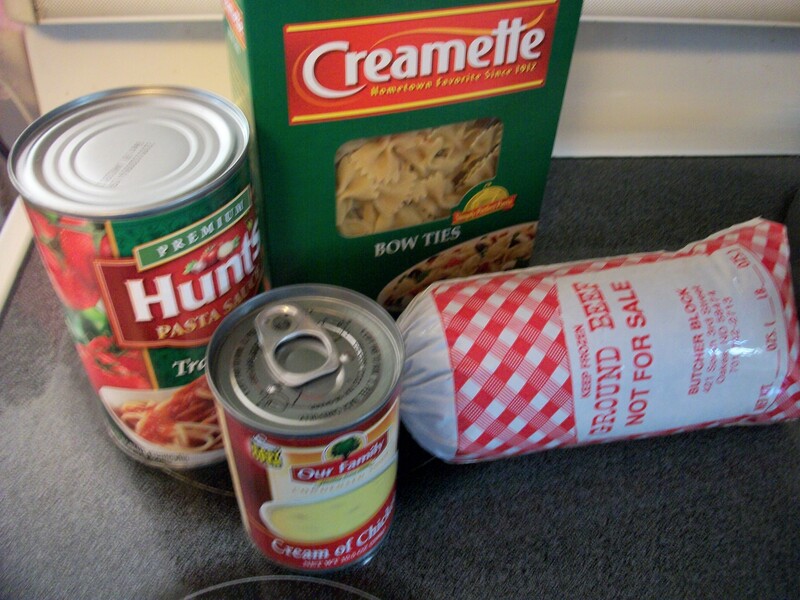 Add soup, spaghetti sauce and browned, drained hamburger to cooked noodles in a baking dish. 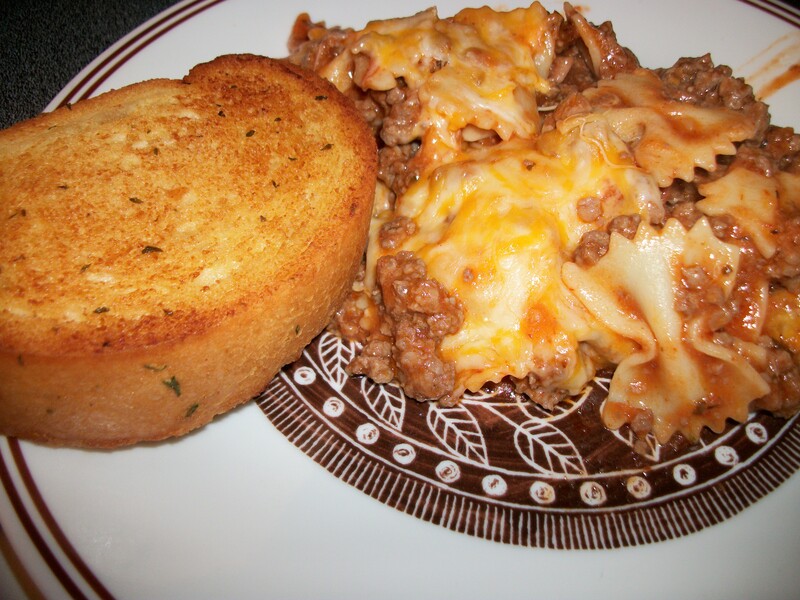 Top with shredded cheese and bake at 350* until the cheese is melted. 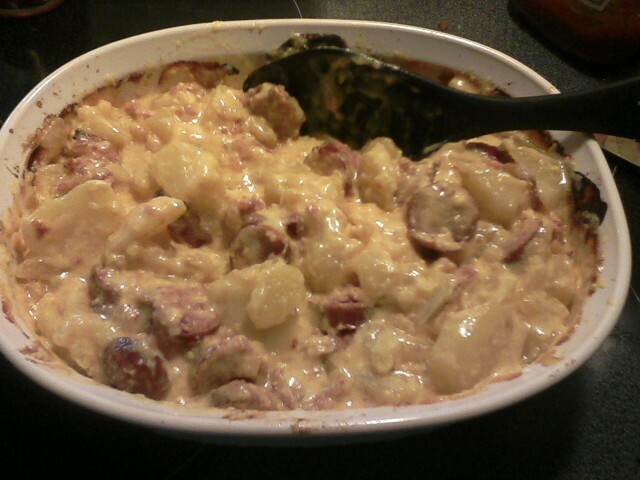 Hotdish finished, and served with garlic toast! Want an extra entry? Subscribe to my blog and leave another comment saying that you did so, or follow me on Twitter at wagfarms, or our tweeting cow at Cows_Life (just leave a comment for each, saying that you’ve followed). Take care and good luck! 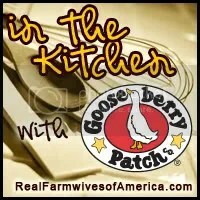 And don’t forget to head over to the Real Farmwives of America and Friends and vote for which Gooseberry Patch coookbook that I should cook from, I’ll be giving away a cookbook from there as well!